Gather ’round makers, it’s innovation time! 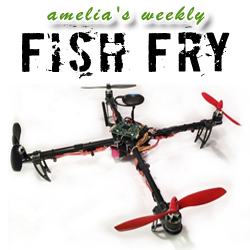 In this week’s Fish Fry, we’re checking out the Texas Instruments Innovation Challenge North America Design Contest with Steve Lyle from TI. Steve introduces us to this year’s super cool winning entries including an advanced new synthesizer that will change how the physically disabled create music, a new wearable that will help the hearing impaired communicate with others, and a full flight control system designed for quadrotor unmanned aerial vehicles that could change how unmanned search and rescue missions are carried out. Also this week, we look into a new IoT product launched by Project Overlord (yes, really).